You can't be too rich, too thin or - in today's business environment - have too much bandwidth. 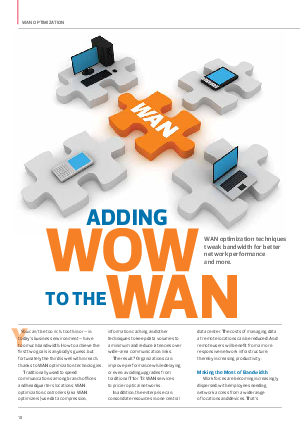 How to achieve the first two goals is anybody's guess, but fortunately the third is well within reach, thanks to WAN optimization technologies. Traditionally used to speed communications among branch offi ces and headquarters locations, WAN optimization controllers (aka WAN optimizers) use data compression, information caching and other techniques to keep data volumes to a minimum and reduce latencies over wide-area communication links. To learn more download this whitpaper.